Interests:Dioramas that comment on current pop culture and society, often in a humorous way. There is a small group of modelers out there today called dioramists. In effect, they are the greatest creators of that genre in modeling known as "dioramas" or models contained within a particular context rather than presented alone or on a stand. Dioramas offer the modeling these "contextual environments" for kit models or (increasingly) 3D printed models. Within the genre of dioramas (as modeling creations) there is a sub-genre called "box dioramas" and it is this sub-genre that this post is really about. One can waste a lot of time listening to all the BS in culture today. Or, one can visit the Box Dioramaswebsite where one can get lost within. The drama and the scenes expressed on the Box Diorama site are much more than a collection of miniature scenes but rather a number of powerful stories frozen in time. Box dioramas are created by some of the greatest modelers in the world but the real goal of box dioramists is not about creating models. Rather, it is about creating illusions. This art of illusion has little interest to fine-scale modeling enthusiasts. In effect, "box dioramas" are never just about particular model kits. Rather, they are about particular environments of the model in the context of time and space. It makes all the difference in the world. The box dioramist sees and understands the context that the symbol in the diorama attempts to speak to us within. It allows the artist to speak to his audience with a 3rd person narrative voice of context of a situation. It makes a comment on things from this third person narrative position on viewing the relationship of a model within a scene. The other night I heard Jim Steinmeyer on Coast-to-Coast radio. Jim is one of the greatest illusionists in the world and wrote a book just published called The Secret History of Magic. I immediately got a copy of it from my local library and am now reading it. I sent an email to Jim Steinmeyer today and also an email to one to one of the greatest box dioramists in the world, my friend Darryl Audette. Darryl is on the forefront of the illusionist dioramists today. Importantly, he is working in the dramatic compacity of performance theatre attached to a university in Canada. Darryl is one of the first to successfully combine theatre and drama with dioramas. He is a pace-setter in this area showing that the connection between dioramas and the art of theater and film is close indeed, needful of future research. Here, in the Columbus, Ohio chapter of the IPMS (International Plastic Modeler's Society) dioramas and certainly "box" dioramas are pretty much unknown. Most members are interested in various kit models - old airplanes are a favorite modeling theme with the group. There is little interest in modeling environments of the kit models. The goal of making the model look real rather than placing the model in an environment or context. The interest of club members is in creating the reality of a modelrather than the illusion of an environment. But illusion is always within the environment and never within a particular object within the environment. Like the magician's object the audience is directed to focus on, the magic is in the area around the object. Box dioramas are at the forefront of creating illusions, of placing objects in symbolic environments in the same way that film or stage sets place actors in symbolic scenes. I had originally wanted to create a scene with a helicopter over a night-time desert with its search-light beaming down and searching for the escape prisoners of a maximum-security prison. How to create the beam of light from the helicopter was the originating special effects idea for the scene. There is the white spray-painted piece of wood dowel attached by Gorilla Glue to the helicopter hovering above the night-time desert outside the prison gates. But this does not look right for some reason. I remove the helicopter and mold some mountains (using a WoodLand Scenics Shaper Sheet) against the panoramic background of a curving piece of dark blue poster board from Staples. I cut a hole in a ping-pong ball and stuff blue tissue inside the hole. I place the ping pong ball on a little close-out LED light from Staples. On a Litra Light, I place a blue filter and over this the diffuser cap. I hold the blue light a few feet away to suggest the hint of moon glow. I photograph the scene in a dark room using the High Dynamic Range technique. 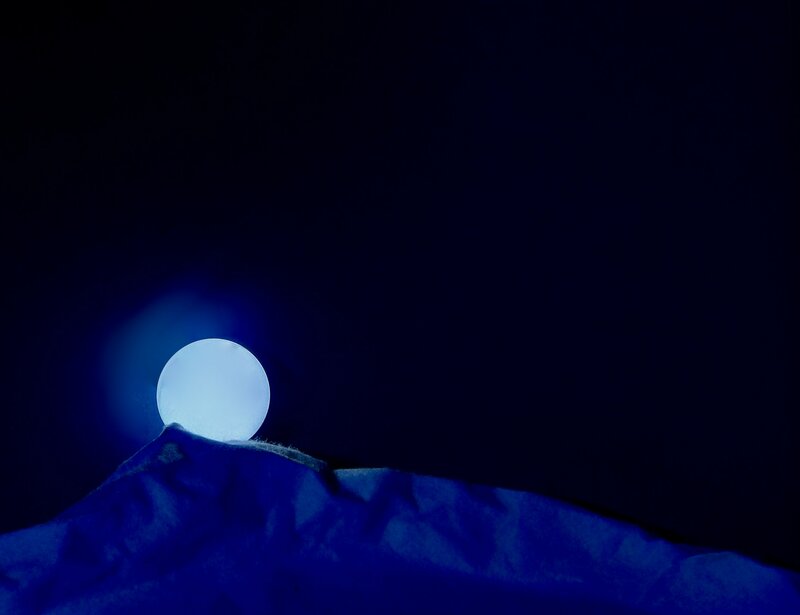 A full moon rises over desert mountains on a pitch-dark night. Perhaps something else is needed in the scene to create a story but for now it looks fine.